Getting pregnant doesn’t mean you have to give up your weekly yoga class. In fact, the benefits to staying active during pregnancy are tremendous, and practicing yoga during your pregnancy can be a great option! 1. Get Your Doctor’s Approval. Be sure you’ve discussed your exercise program with your doctor and that you’re cleared to exercise. 2. Avoid Overstretching. Once you become pregnant, your body produces a hormone called “relaxin,” which, just like the name implies, helps to relax your ligaments, allowing for baby to be birthed through your pelvis. This doesn’t just affect the ligaments around your pelvis, but your entire body. So limit your range of motion, moving through a range that feels good for you and never painful. 3. Chat With Your Instructor. When looking for a yoga class, check to see that the instructor is aware of modifications for pregnancy, especially if you’re not joining a specific prenatal yoga class. 4. Wear Layers. Even in non-Bikram classes, a yoga room can heat up quickly! It’s always best to play it safe, wearing layers that can be shed as the room (and your body) heats up. 5. Stay Hydrated. Be sure to drink plenty of water, keeping a bottle next to you during all workouts. Hydration is especially important during pregnancy, as dehydration, especially later on, could cause preterm labor or false early labor. 6. Avoid Excessive Twisting Poses. If you’re conditioned and have been doing yoga twists prior to getting pregnant, you may be able to continue during your first trimester, but only if they feel good for your body. If you’re not conditioned for twist poses, now is not the time to start, so modify and choose other pregnancy-safe poses. 7. Approach Inversions Carefully. Again, if you haven’t been doing inversions prior to pregnancy, it’s best to avoid them. However, if you’re an avid yogi who has done inversions previously and they are comfortable for your body, then, by all means, carry on as long as they feel good for you. As your pregnancy progresses, you may find yourself needing to minimize your time spent in inversions. If your doctor has told you to avoid inversions, then do so. 8. Focus on Strength. Move through a controlled range of motion in which you can feel your muscles activating and working to hold you in those poses, not just stretching. This is very important and will help you reap the amazing benefits of building strength. Start thinking about yoga poses that help you feel strong, and avoid falling into stretches unless they are specifically for relaxation. 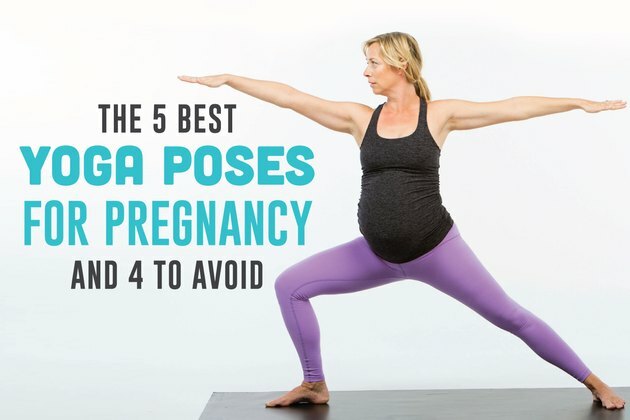 Now that you understand some guidelines to follow during pregnancy, here are four of the best prenatal yoga poses that are safe for you and your baby. Remember to make modifications as needed, especially as your pregnancy progresses. This pair of poses is a safe go-to exercise for all stages of pregnancy and great for strengthening your deep core muscles while lengthening your spine. Use this exercise to help in stretching your belly when you hit growth spurts, and be sure to practice deep belly breathing on this one! Safe for all trimesters of pregnancy, this is a good pose to strengthen your legs and core while lengthening your spine and opening up your sides. If you start to experience any uncomfortable pulling in your pubic area or the front of your hips (most likely in your third trimester), first try decreasing your range of motion. If you still experience any discomfort, discontinue Warrior 2 for the remainder of your pregnancy. Many women love this pose for opening up their hips and strengthening their core, glutes and hamstrings. It’s safe for all trimesters, unless you don’t feel comfortable on your back. Tip: Be sure to start on your side, then roll to your back, moving your body into bridge pose, this helps minimize stress on your rectus abdominis (front part of your abs). This is a wonderful option for opening up the front of your hips and glutes! When holding pigeon pose, think about keeping a light core connection and lengthening through the top of your head. This allows for deeper opening of your hips by giving your deep core more support, rather then just sinking into the stretch. While this pose is safe for all trimesters of pregnancy, as your belly grows you may need to modify it by propping a pillow under your hips. This pose challenges your balance while strengthening your core and legs. Turn on those glutes, stand tall and breathe deep! It’s safe for all trimesters of pregnancy — just be aware of your balance shifting as your pregnancy progresses. You may find placing one hand on a supportive surface or using a wall is needed to help steady your balance. There are many variations of the twist — some seated, some in this plank-type position in which you twist through your torso and close in on your belly. If you’ve been doing twists prior to becoming pregnant, you may be able to continue doing them through your first trimester, but only if they feel good for your body. Beyond the first trimester, you should avoid them because they put too much stress on your belly. This pose and any other related poses that have you lying on your belly put a lot of pressure on your belly and need to be avoided your entire pregnancy. It’s a good idea to avoid any exercises that put additional stress on your belly, such as boat pose, low boat pose and other “crunch-type” poses. This could increase the severity of diastasis recti (abdominal muscle separation). There are many other poses and exercises that are much safer and more effective for properly strengthening your core during pregnancy. Are you currently pregnant? Are you an active yogi, or are you just now looking to start? Do you think you’ll incorporate these poses into your practice? How do you plan on having a fit pregnancy? If you’ve been pregnant before, what did you do during previous pregnancies to stay active? Share your thoughts, stories and questions in the comments section below!